1966. Onboard Gemini 12 were Command Pilot Jim Lovell (who later flew as commander of the ill-fated Apollo 13), and Pilot Edwin Aldrin (who later made the first landing on the moon with Neil Armstrong on the Apollo 11 mission). As part of his spacewalk, Aldrin was to attach the tether onboard the docked Agena spacecraft to their Gemini 12 capsule. He and the engineers planning his "extra vehicular activity" (EVA) had learned a lot from the previous spacewalks, including the one of Richard Gordon during the previous Gemini mission. Additional and improved astronaut restraints had been added to the outside of the Gemini 12 spacecraft. Moreover, Aldrin had been training for his spacewalk in a swimming pool, putting just enough weight on his suit so that he would neither sink nor surface. This exercise technique turned out to be very realistic and extremely useful, and has become an essential step in all spacewalk preparations since then. Aldrin's real spacewalk lasted no less than 2 hours and 20 minutes, but thanks to the thorough preparations it took him much less effort to perform the various tasks than it took the previous astronauts. Hand over hand he moved along a rail to the nose of the Agena docking adapter. Using his waist tether for restraint, he then tied the tether to Gemini 12's docking bar without experiencing any of the problems Gordon had encountered. With the two spacecraft connected by the tether and Aldrin back safely inside, the attempt at gravity-gradient stabilization could begin. 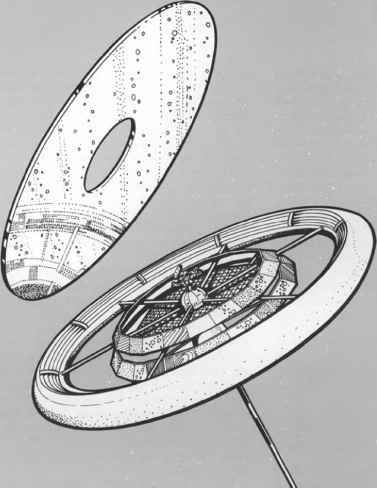 Lovell undocked from the Agena target vehicle and backed his spacecraft carefully away so that the Gemini, the tether, and the Agena formed a pole vertical to Earth. The tether deployed smoothly, with only a brief hang-up, but it would not become taut. Lovell tried to straighten the cable using the spacecraft thrusters, but was unsuccessful at this and also had difficulty controlling the Gemini's attitude. "Every time I wanted to pitch up or yaw, I would roll,'' he later reported. Nevertheless, even though the tether tended to remain slack and only tautened occasionally, according to the crew the vehicles did become stabilized as a result of the small difference in gravity between the spacecrafts' slightly different orbital altitudes. Both vehicles' attitude was upset occasionally, with Gemini 12 even wigwagging by about 300 degrees at one time. Tether dynamics were clearly more complicated and problematic than the theory had predicted. In its formal mission report, NASA stated that what caused the disturbances "is not completely understood, nor is the system behavior during and immediately following these excursions.'' 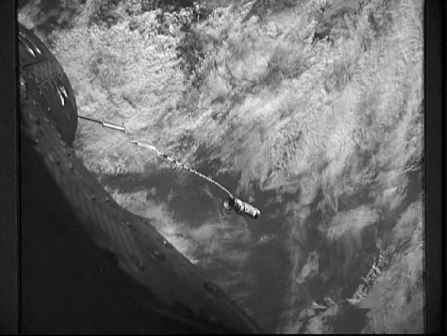 After 4V2 hours of tethered flight, the crew released the tether by jettisoning the docking bar (Fig. 4.3). some level of gravity-gradient stabilization. Both methods had revealed inherent difficulties, and more tests would clearly be necessary to completely master the complex dynamics involved. However, the Gemini program had ended, and no tethers were needed or flown during the subsequent Apollo program. It would be a long time before anybody would attempt the next tether experiment in space.